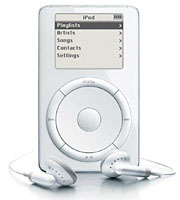 To continue the theme below, can you image a world where the only MP3 player was an ipod? What if the only product was an ipod? Is ipod, and apple destine to take over the world? Are we destined to live in a mono culture? Destined to face extinction, at the slightest change in are environment due to over specialization, are we too, to share the fate of the dodo, are we just waiting for a Dutch sailor with a big club? Thanks to this link over at FSKlog Print it, glue it, stick your mp3 player inside, and no one will ever know the difference, and when the iPod eaters from outer space arrive quickly shead your old skin like a snake, and reveal your true colours.